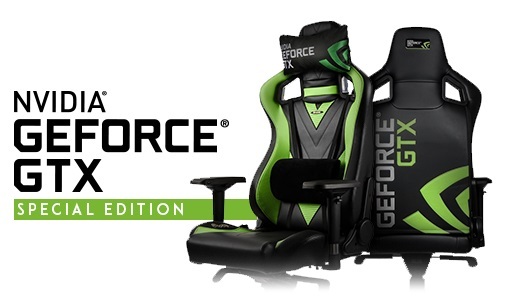 Read more on Noblechair's new Nvidia Edition Epic series chair. Disgusting. My wife would disembowel me if she came home to that honking thing sat in our living room. I mean in the Nvidia boardroom? yeah, I can get that. But actually in your house? dear god. way too much fanboyism going on with this. only place i see this is in a modders workshop. Thats it. It's definitely not something that I would ever want, but it does seem to be a statement of how much of a Nvidia fan one is. It might look like I'm not doing anything, but at the cellular level I'm really quite busy. I do like this design though! I have never gotten the appeal why people like these themed parts like "Branded" cases & such, But looks like there is a market for this kind of stuff. How can you not understand them? Noble chairs are quite fashionable in a sense they make an office look professional, a home desk look like its a work station. Or a gamers station look like a mature setup. Do you honestly say that you would have this in your home with your partner/family having to put up with its hideous logo emblazoned all over it? From my point of view, it just stinks of immaturity, catered for some sub 18yr old in his bedroom. Anyone with their own house/apartment would need to get their head checked if they thought this would be a pleasant addition to the furnishings of their dwelling. I might like the nvidia logo, but this is OTT. And yes, there are ESL gaming chairs, but interesting part is that on norwegian sites here, those usually never sell. Nobody wants them. They are always in stock where as plain coloured, ones have to be ordered due to popularity. Some ESL chairs are even discounted here, just to try and get rid of them. I don't see it as fanboyism, i see it as childish.